You are currently browsing the daily archive for April 17, 2010. 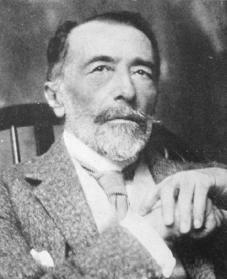 Joseph Conrad was born nine years before Kipling, though he too lived well into the 20th century. Being Polish, with English only his third language, he began writing relatively late in life, and his publications parallel Kipling’s in date. There are also parallels as to subject matter, for both wrote about the colonial experience in early life, and then set their later writings in the West. There are distinct differences too. Kipling wrote about India, and the relatively ordered system of the British, whereas Conrad dealt with South East Asia and Africa and the tremendous scope they offered to loners discovering themselves in the process of dealing at different levels with unfamiliar society and terrain. Then, while Kipling retreated at the end to the domestic joys of Sussex, Conrad explored the world of anarchists and spies in two compelling late novels, ‘The Secret Agent’ and ‘Under Western Eyes’. In between, whereas Kipling wrote about Massachusetts cod fishermen in ‘Captains Courageous’, probably his weakest work, inspired by his association with his American future wife Carrie, and her brother Wolcott Ballestier, Conrad produced as his American adventure ‘Nostromo’, perhaps the most masterly of all political novels. Set in a fictional South American republic, developing from the remains of Iberian colonialism, it deals with the enthronement of a new form of colonialism that is concerned primarily with commercial interests. To ensure their perpetuation, possession can be abandoned, provided a government that is amenable to them is established and reinforced.